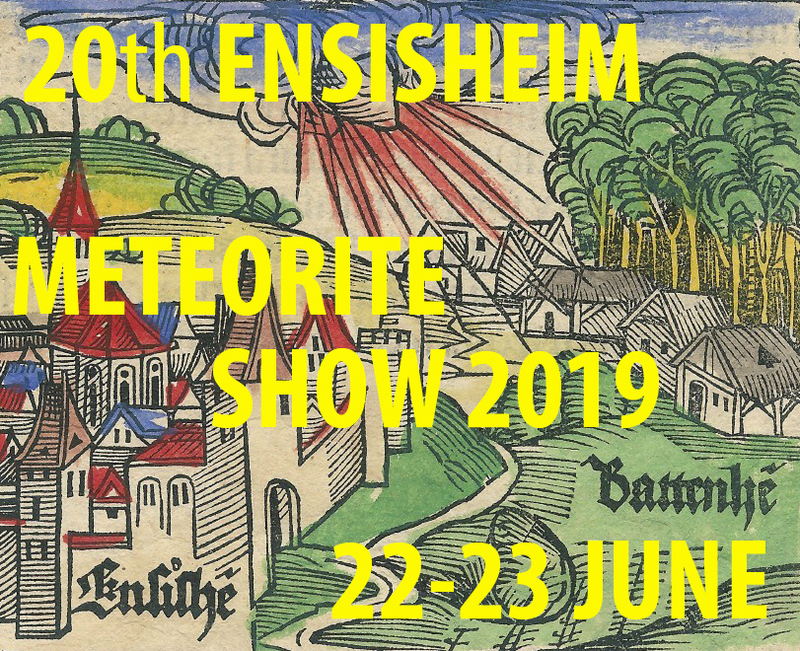 History: (Mike Hankey, Larry Atkins, Laura Atkins, Josh Adkins, Brendan Fallon, Robert Matson, Marc Fries) On Sunday Morning 24 January at 10:27 EST (15:27 UTC) a large daytime fireball streaked across the sky in northern Florida. Over 100 eyewitnesses reported the event to the American Meteor Society (Event 2016-266), describing a white sparkling head and plume of white smoke left behind. Fireball researchers Marc Fries and Rob Matson, found the American Meteor Society witness trajectory intersected with a group of radar returns that appeared shortly after the fall. The radar returns were strong, found at multiple altitudes and located on multiple stations: KJAX, KVAX and KTHL. Larry Atkins was the first on the scene. Mike Hankey arrived 5 days after the fall with Brendan Fallon and joined Larry and Laura Atkins in the hunt. On the 6th day, Mike Hankey found the first stone at 8.5 g on the eastern edge of the primary radar return. Within 2 hours Larry Atkins found the second stone (18.5 g) directly under the radar. The next day, two more stones were found: a 5.5 g stone by Laura Atkins and a 48.5 g stone by Mike Hankey. Six days later over 2 miles away from the first find, an 839 g mass was found by Josh Adkins and Brendan Fallon. A week after that, Larry Atkins found the last stone, weighing 75.5 g. In total 6 stones were found over a three week hunting period for a total weight of 990.5 g.
Physical characteristics: Thin, well formed shiny fusion crust covers the exterior of four of the stones, while two of them, the 43 g and the 839 g are matte black. This is likely due to submersion in wet sand and/or water prior to recovery. Some small rust spots are evident on some of the stones as well. Small regmaglypts are present on the 43 g and the 839 g stones, and the remaining stones are irregularly shaped with little to no orientation. Some chondrules are visible through the crust. The interior of the meteorites are slightly darkened due to shock. Shock veins are present, some of which are black while others are filled with metal, appearing as long “strings” up to 3 mm long. Though most of the chondrules have been altered and are not well defined, some rare, large chondrules up to 0.8 mm are present. Petrography: Plagioclase grains are up to 100 µm in size, consistent with type 6. No maskelynite was found. 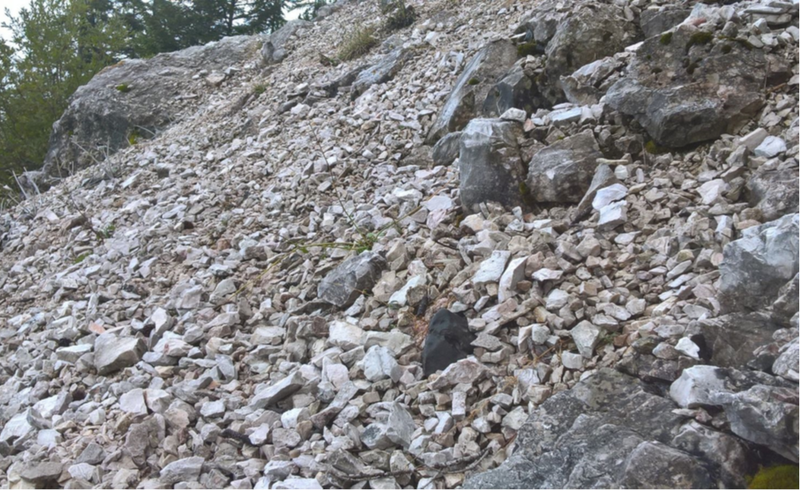 There are numerous chromite-plagioclase assemblages, consistent with moderately strong shock. Chromite grains are fractured. Troilite is polycrystalline. Metallic copper occurs as 2-µm-thick bands at the metal-troilite interface in an opaque assemblage. The chondrules are recrystallized and poorly defined. The only discernible chondrules are large ones, 800-1000 μm across; these are BO and PO textural types. Geochemistry: Olivine Fa23.7±0.3 (n=21), Orthopyroxene Fs20.2±0.2Wo1.6±0.2 (n=14). Also present are small grains of diopside: Fs7.4 Wo44.9 (n=1). Plagioclase has a mean composition of Ab71.7±1.6 Or8.8±2.5 (n=8); the low Na and high K values are a result of shock. 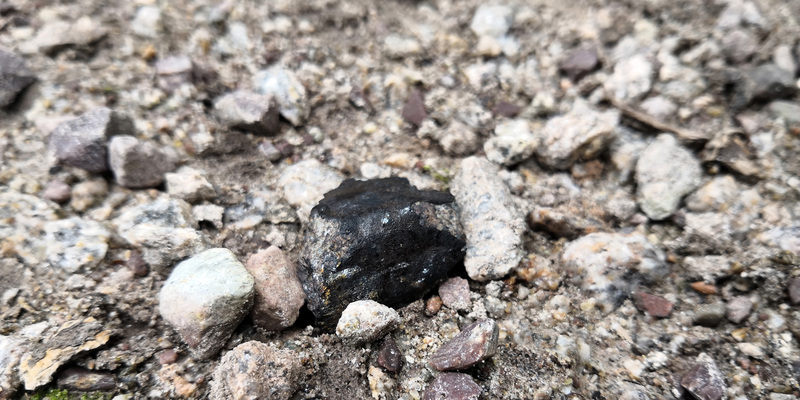 As reported by Larry Atkins via the meteorite-list on February 14 the first six meteorites (990.5 g) of the bolide seen on January 24, 2016 at 10:30 am EST above Northern Florida, USA have been found in Osceola National Forest (~ 30°27’44.9″N, 82°31’08.9″W) on January 31, 2016. 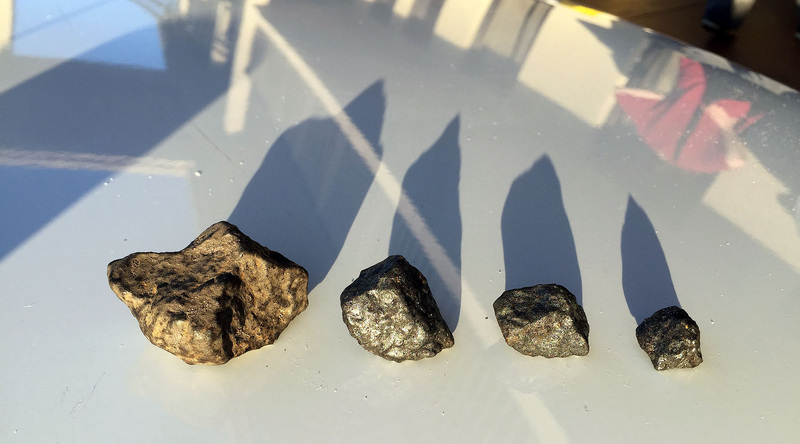 Photo showing the first four of the six found meteorites (8.5 g/28.5 g/? g/42.5 g/800 g/80 g).